For the past several months there have been persistent reports in the media about the possibility of a coalition between the Economic Freedom Fighters (EFF) and the main bourgeois opposition party, the Democratic Alliance (DA), at local government level. Now the leadership of the EFF have confirmed that discussions have taken place. However, if a cooperation agreement between the EFF and the DA on the electoral plain is struck and a popular front becomes a reality, it could deal a blow to the future prospects for the Fighters and put them on the path opposite to which society is moving. The Sunday Times reported that discussions between several opposition parties are taking place ahead of the local government elections. According to the paper the leader of the EFF, Julius Malema, has called for coalitions of opposition parties after this year’s local government elections in municipalities where the African National Congress (ANC) fails to win an outright majority. The proposal is that the elections will be contested separately, and where an opposition party wins more than 50% of the votes, then no coalitions will be formed. Only in instances where the ANC fails to win more than 50% of the vote will a coalition of opposition parties be formed to keep the ANC out. Based on previous voting patterns, in at least three key metropolitan areas - Nelson Mandela Bay, Tshwane, and Johannesburg—the ANC might fall below 50% in this year’s local government elections. This would open up the real possibility of a coalition government of opposition parties. Although there exist a host of opposition parties, they are extremely small and very fragmented. In essence, only the DA and EFF are big enough currently to pose any kind of electoral challenge to the ANC at local government level. This is not the first time that a proposal for a coalition between the DA and the EFF has been proposed. Already in July last year Malema said publicly that the EFF will be open to working with opposition parties in the forthcoming local government elections. 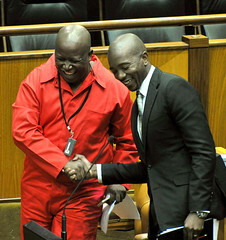 In an interview with Reuters, Malema confirmed this and called on a grand coalition of parties. “South Africans must shoot warning shots now, through their votes . . . It is an opportunity now for South Africans to show the ANC that they are tired; that the ANC should begin to take them seriously, ahead of the national elections in 2019,” Malema said. The immediate reason why the DA would consider such a coalition is because it is stagnating. This is rooted in its origins in the former Progressive (later United) Party, the former liberal wing of the regime under apartheid. With the demise of the National Party, the ruling party under apartheid, the DA has grown to the extent that it has by absorbing the conservative Afrikaner petit-bourgeoisie which formed the National party’s support base. But now the DA has reached a ceiling as the vast majority of blacks, even many from a petit bourgeois background, still associate it with the apartheid regime. Therefore, the party is struggling to get the support of the black masses in sufficient numbers to pose any kind of threat to the ANC. By forming a coalition with the EFF, the DA is seeking legitimacy amongst the black workers and youth. This confirms the favourable balance of forces towards the working class. For the past two decades the bourgeoisie were forced to rule society through the leadership of the ANC. But the crisis of capitalism has to a great extent eroded the unrivalled political authority which the ANC leaders enjoyed in the past. Now the former liberation movement is facing declining support due to a falling economy, high unemployment, mismanagement of public resources, corruption scandals involving President Zuma, and a widening gulf between rich and poor. In the final analysis, this is due to the ANC’s pursuit of out-and-out capitalist policies over the last two decades. Having abandoned its liberation-era policies of nationalisation of the economy, and by striking a deal with the capitalists which kept the system intact, the ANC accepted responsibility for managing the crisis of capitalism. This was not what the majority of the supporters of the ANC were fighting for. For the masses, the fight for democracy was a fight for an end to poverty, hunger, and want. It was a fight for jobs, housing, and a better life. Instead, only a small layer at the top of the former liberation movement has benefited. For the vast majority, nothing fundamental has changed. Over the last period the anger which has been building up has resulted in the fragmentation of the ANC along class lines. The biggest manifestation of this was the crystallisation of forces to the left of the ANC - the EFF, on one hand, and the metalworkers’ union, NUMSA, on the other. This is an extremely important phenomenon and signifies the moving of society to the left. Both organisations have rejected the ANC’s National Development Plan and are insisting on the implementation of the Freedom Charter. Both NUMSA and the EFF are very radical and have received mass support from large sections of society. NUMSA is one of the fasted growing unions in the world, and the EFF has completely dominated the discussions in parliament since the last national elections and are often at the forefront of public debates. With the collapse of the authority of the ANC leaders, the capitalists realise that it is no longer possible for for these leaders to hold the working masses back. This poses a grave danger to the bourgeoisie because the masses are moving through channels which the capitalists have no control over. On the other hand, their own forces, like the DA, possess even less legitimacy than the leaders of the ANC in the eyes of the workers. The EFF’s militant and radical rhetoric has provided an outlet for some of the anger which had been building up in society, especially amongst the youth. Seeing this, a section of the bourgeoisie now considers the possibility of containing the rise of EFF by channeling their healthy militancy into the death trap of popular front politics. The new DA leader, Mmusi Maimane, has not ruled out the possibility of an electoral coalition involving the EFF. “Our focus as the DA right now is to achieve the best possible result in next year’s municipal elections which includes retaining Cape Town, winning Tshwane, Nelson Mandela Bay and bringing the ANC below 50% in Johannesburg. We will consider the matter of coalitions if applicable after the election results are declared,” he said last year. The reason for his cautious approach is that the DA itself is divided on the issue. Before the 2014 national election, former leader Helen Zille was unequivocal that the DA would not be willing to work with the EFF. “I wish to state categorically that the DA will not enter into a coalition with the EFF under any circumstances. A coalition with the EFF would be unworkable given the huge ideological gulf between our parties. The fact is that the ANC and the EFF are two sides of the same corrupt coin,’’ she said. However talk of a coalition is causing contradictions between the liberal and conservative wings of the party. The conservatives are aghast at the possibility of a coalition with the EFF. The DA is an alliance between conservative Afrikaner petit-bourgeois elements who derived their land, wealth, and privileges from the forceful dispossession of the black masses, and the liberals who own the biggest share of the country’s economy. The very idea of working with the EFF, a party which is seen as standing for the nationalisation of the strategic sectors of the economy and the expropriation of land without compensation, is anathema. The danger for Maimane is that pursuing a coalition with the EFF forcefully could be counter-productive, repelling a section of his conservative base. Malema’s first goal in the local elections is to beat the ANC wherever he can. He has flatly rejected any suggestion of a coalition with the ANC. Although he is contesting the local elections on their own merits, his real aim is to use it as a springboard for the 2019 national elections in which he hopes to strike a heavy blow to the ANC. But there is also a broader and more overarching goal which determines all his actions. Malema believes that it is possible to reconcile the divergent interest of capitalist society with the radical programme of the EFF. In other words, he believes that it is somehow possible for the working class to achieve its aims and to peacefully coexist with the capitalists - all that is needed is to convince them. This explains the series of meetings between a range bourgeois elements and the leadership of the EFF over the last few months. These includes meetings with business executives in the United Kingdom recently. In turn, many business leaders, executives, directors of commerce and industries, etc., were all too keen to meet the EFF leadership. Many of them have adapted themselves to the situation and have sought to change their approach to the EFF over the recent period. Seeing that their demagogic rhetoric against the EFF is not working (and in fact is having the opposite effect), a section of the capitalists are changing their tune by pretending to “seek a better understanding” of the EFF. Clearly, these people have decided that it would be much more prudent to keep your enemy close and to co-opt it into the running of capitalist society. That is co-opt it into the attacks against the living standards that the system and the capitalist class demands. On his recent trip to the UK, Malema expressed his idea of coexistence and social peace in a number of forums. Whilst in Oxford Malema proposed the idea of employees shareholding schemes as a solution for both capitalists and workers. “We need to put more money into the pockets of the workers. It’s the most practical way of redistributing the wealth in South Africa. It will do away with industrial action. Why would workers go on strike if they knew last year that ‘each one of us got R60,000 through dividends and we’re told if we double up (production) we’ll get R120,000’. No-one will sleep! “When a union leader comes to mobilise for strikes, they’ll say no, a strike will jeopardise our dividends. Imagine they get bonuses and dividends and you tell them to go and strike, you will be speaking a foreign language to them, they will never agree to go into unnecessary industrial action", he said. This idea is nothing new and many capitalists agree with this. Actually it has been been implemented in South Africa on a number of occasions. Kumba Iron Ore introduced a whole package of these schemes recently. But whereas the company paid out the dividends last year, this year it laid-off thousands of workers due to the collapse of global commodity prices. This shows that such schemes are not a solution because it does not go beyond the system of capitalism which is responsible for the crisis. The only result it has is to put more economic pressure on the workers in order to exploit them more. But while Malema is trying to convince the capitalists of his plan, the only reason they take him seriously is the masses that he is mobilising. An example of this was when he led a mass march of 50,000 people through central Johannesburg. The aim of the march was to present a list of demands to key bourgeois institutions like the Johannesburg Stock Exchange, the Reserve Bank and the Chamber of Mines. For the masses, the march was an opportunity to express their hope, frustrations and aspirations through the channels which the EFF was providing and which they hope are summarised in the list of demands the party handed over to the representatives of the capitalists. Malema’s radical measures, mass mobilisation and rhetoric is clearly gaining an echo amongst the angry and frustrated masses. But whereas the masses do not necessarily read the smallprint of programmes, memoranda and lists of demands, the same cannot be said of the capitalists. After the march, Peter Bruce, a key strategist of Capital and former Business Day editor wrote a column in which he analysed the twenty-three demands which the EFF handed to the Reserve Bank. He wrote: “For capitalism to survive here, it has to be more inclusive. We must somehow democratise the way we create and spread wealth. Try as you might, there is no other way. And the good thing about the march, for me at least, is that the poor want in to the system, not to break it. How lucky can you get? His approach is very revealing and typical of a section of the more far-sighted representatives of Capital. First he praised Malema for emphasising the need to focus on the economy and then he tried to flatter Malema into a compromise by pretended that that could serve the interests of both sides - something Malema also believes. But the capitalists do not believe a word of this. 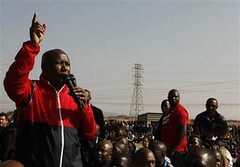 Although this sly bourgeois tried to placate Malema by saying that some of the demands are useful, he essentially poured cold water over them by calling them “playing to the gallery” and “naive.” On the other hand, Maimane’s approach to the continuation of further talks is also revealing. He has set down very strong parameters, namely, adherence to the the country’s constitution (which protects property rights), commitment to a free market economy, non-racialism, and professionalism. (Daily Maverick 1/2/2016). This would mean that any party which aligns itself with the DA would inevitably have to abandon any socialist policies. This is typical of how a popular front works - the bourgeois insists that the working class organisation water down its programme while keeping its own programme intact. But it is also a reflection of the irreconcilable interests of working class and the capitalist class. This strong stance has hardened relations lately. At a news conference on February 4th, Malema emphasised that any coalition agreement must be based on the EFF’s programme. At first glance this would sound like a strong rebuff to the DA. But this is at odds with what Malema and the EFF has said from the beginning when he suggested that an agreement must be based on “contractual relationships’’ and “annual targets.” This suggests that Malema is vacillating, or at least giving serious consideration to the possibility. Moreover, Malema is insisting that his first priority is to unseat the ANC wherever he could in the local elections. But the only way this could happen in the metropolitan areas is precisely to form a coalition with the DA since neither party is strong enough at this stage to unseat the ANC on its own. The Sunday Times’ article says that what was being discussed was a “united front.’’ This is incorrect. A united front is a front of working class organisations. The DA is not a workers’ organisation. It is the main party of the capitalists, with adherence to the market economy enshrined in its constitution. What is being proposed is not a united front, but a popular front. A popular front has nothing to do with revolutionary politics. It is a policy of class collaboration with the bourgeoisie. The answer does not lie in deals with the capitalists, but by orientating towards the working class. Currently there is a massive class division in the ANC between the leaders, bureaucracy, careerists, and capitalists at the top, and its working class base. The formation of EFF itself is an outcome of this division. This working class base has moved in the opposite direction to the leaders, and they have often been at the forefront of the explosive growth of strikes and community protests over last few years. The majority of these protests have taken place at the local government level and have centred around the non-delivery of houses and the cut-off of basic services like water and electricity. Many of these protests have also taken place in poor areas in the Western Cape where the DA is the governing party. Should the EFF align itself with the DA in some local governments, it runs the risk of being chained to capitalist policies like the user-pay principle, which is being used by the ANC and DA governments at the local level. This would mean that the EFF would share culpability for the cutoff of basic services to poor communities, which is its base. This will severely curtail future prospects for the EFF. Of course, a deal between the EFF and the DA is by no means a forgone conclusion. Nor is it a certainty that if a deal is reached, that it will hold. As we have explained, the DA bureaucracy is mindful of the implications if they force a deal through against the consent of the more short-sighted and conservative base. The situation is so delicate for the DA leaders that they risk plunging the party into a deep crisis which could even lead to a split. Such an outcome would push the balance of forces even more in favour of the working class. But neither should the EFF’s flirtation with popular frontism be downplayed. With the bourgeoisie alarmed at the situation and looking for a way out of the crisis of their system, it is not for the Left to give them any life-lines. South African society is moving to the left. The mass outrage by workers over recent attacks on workers’ pensions which were signed into law by Zuma is the latest indicator of this. However, the attacks against living standards, the rising inequality and the falling living standards in South Africa are not caused by this or that corrupt politician. The ANC’s main weakness is not the personality of individuals leading it, but the fact that they have accepted the boundaries of the capitalist system. Thus they have also accepted to carry out the attacks that the system requires. The task of the left, therefore, is not to form alliances with capitalists whose interests are tied to the preservation of the system. But to fight alongside the working class to overthrow them. The EFF grew to be the mass force that it is by its militancy and robust nature and by expressing the revolutionary anger of the South African masses against the ills of capitalism. The only way to satisfy their aspirations is to concentrate this struggle by unifying the working class against the ruling class as a whole. Instead of a front with the DA it should therefore put forward a united front with NUMSA, the radical metal workers union. At its historic special congress in 2013, NUMSA announced a process for the establishment of the “Movement for Socialism”. Recently it is expressing this idea more explicitly and is now openly talking about forming a workers’ party to “destroy the capitalist system.” If the new party was to materialise it would be a huge step forward for the South African working class. A bold, decisive and resolute lead of by the powerful metalworkers’ union on the political front would cut across all the countervailing factors which are bedevilling South African society. The central role it plays in the production process, the political authority it possesses, coupled with its greater working class influence, will pull all other layers of the working class, as well as all the wavering elements of the petit-bourgeoisie, behind it. This would have major revolutionary implications and it is these forces which are the natural allies of the youth and poor who support the EFF. South African capitalism is in an acute crisis. The bourgeois is increasingly alarmed at the situation. This causes divisions between them. At the same time they are beginning to look for ways to shackle the workers’ movement. In trying to do this, they are causing even further divisions among themselves. On the other hand, the working class has flexed its muscles over the recent period. Other layers, such as the students, have been drawn into the struggle. South African society is now preparing for a level of class struggle never before seen. A unity of the EFF and NUMSA on a revolutionary programme of nationalisation of the commanding heights of the economy under the democratic control and management of the working class would galvanise the anger of the masses and become the largest political force in South Africa. This in turn could prepare the way for a socialist revolution in the country sending shockwaves throughout Africa and beyond.